1. British Labour Party is mad to sign up to the ‘Charter of Budget Responsibility’ (September 28, 2015). 2. The non-austerity British Labour party and reality – Part 2 (September 29, 2015). 3. The full employment fiscal deficit condition (April 13, 2011). 4. Seeking zero fiscal deficits is not a progressive endeavour (June 18, 2015). 5. Jeremy Corbyn’s ‘New Politics’ must not include lying about fiscal deficits (September 15, 2015). 6. British Labour has to break out of the neo-liberal ‘cost’ framing trap (April 12, 2017). 7. British labour lost in a neo-liberal haze (May 4, 2017). 8. When neoliberals masquerade as progressives (November 9, 2017). 9. The lame progressive obsession with meaningless aggregates (November 23, 2017). 10. The New Keynesian fiscal rules that mislead British Labour – Part 1 (February 27, 2018). 11. The New Keynesian fiscal rules that mislead British Labour – Part 2 (February 28, 2018). 12. The New Keynesian fiscal rules that mislead British Labour – Part 3 (March 1, 2018). I provide links to previous blog posts I have written for two reasons: (a) to avoid detailed repetition; and (b) to help people navigate through related issues on what is now a rather complex body of writing. When John McDonnell presented his first major speech on what the Labour Party might do there was an outcry among those sympathetic to Modern Monetary Theory (MMT) who saw it as a harbinger for austerity. The mainstream press also reacted viscerally with the UK Guardian, for example, publishing the commentary (September 26, 2015) – John McDonnell: Labour will match Osborne and live within our means – which predicted the worst. Austerity is not an economic necessity, it’s a political choice … We will tackle the deficit fairly and we can do it … Labour’s plan to balance the books will be aggressive … Where money needs to be raised it will be raised from fairer, more progressive taxation. So in this framing, the Labour Party was signalling that it would continue to construct the macroeconomic debate within the standard neoliberal (mainstream economics) framework. The language and concepts of that flawed approach would be retained. At the time, I wrote that if we consider what John McDonnell said carefully, it may not be as bad as, for example, the Guardian headlines suggested. I also wrote that McDonnell’s speech disclosed a deep insecurity in the Corbyn camp that leaves them adopting fiscal rules, which are in essence the DNA of neo-liberals. The Speech retained the focus on the fiscal balance as if it was the priority, notwithstanding his decomposition into current and capital components. One would have hoped, that a progressive political force would have, instead, endeavoured to shift the focus onto creating full employment and prosperity rather than maintaining the focus on meaningless fiscal ratios. I also wrote at the time that the adoption of the Tory fiscal rule – the so-called – Charter of Budget Responsibility – would still provide Labour with some flexibility for government to avoid harsh austerity. But, the maintenance of a commitment to the Charter could easily become a source of unnecessary rigidity, which under certain (not unusual circumstances) would prevent a Labour government from fulfilling its responsibilities to advance welfare. In particular, the debt commitment was likely to give political grief if the future Labour government tried to stick to it. Notwithstanding my comments above, I have read some rather amazing interpretations of Labour’s fiscal rule in the last week. In response to criticisms from some social media participants that the rule was a neoliberal construct, one of those involved in the design of the rule had the temerity to claim that in actual fact the rule is an exemplar of progressive policy design. Lets first of all understand exactly what the rule is. 1. “close the deficit on day-to-day spending over five years” by matching spending with tax revenue. 2. “make sure government debt is falling at the end of five years”. 3. “will borrow only to invest”. All of this is neoliberal central. But it is important to understand that this doesn’t negate on-going fiscal deficits. It just means that so-called recurrent (or current) spending must be matched by tax revenue over a five-year period. So an application of the rule will also not stop a fiscal deficit on recurrent spending in say year 1 of a new Parliamentary term either. It just means that over a rolling five-year horizon the balance has to be zero. But that restriction is not only unnecessary but also probably not manageable given timing issues. In effect, John McDonnell is proposing Labour will adopt the so-called ‘Golden Rule’, a concept I will come back to presently. There were also some operational guidelines accompanying this balanced fiscal rule. When the Monetary Policy Committee decides that monetary policy cannot operate (the “zero-lower bound”), the Rule as a whole is suspended so that fiscal policy can support the economy. Only the MPC can make this decision. 1. An unelected and largely unaccountable central bank thus runs economic policy in that it instructs the democratically-elected government when it can use its fiscal capacity. 2. It appears that this would occur when the Bank of England judges it is at the so-called “zero-lower bound”, which means nominal interest rates cannot go any lower. A “zero-lower bound” probably also includes a period of very low interest rates. But, as I explain below, this constraint sits squarely with the dominant New Keynesian view that monetary policy is always the preferred counter-stabilisation option (as opposed to fiscal policy) and fiscal policy will only be used as a counter-stabilising force when monetary policy ceases to have traction (zero-bound). Begging the question, of course, is whether monetary policy is effective at any interest rate range. While elevating monetary policy above fiscal policy suited the ideological agenda of ‘small’ government and an increasingly deregulated and unsupervised economy, the evidence would suggest that this reliance on monetary policy has not delivered satisfactory outcomes. I deal with that issue below. Second, the unelected and unaccountable Office for Budget Responsibility would no longer report to Treasury under Labour. Rather, it would report directly to Parliament. The OBR produces so-called ‘independent’ forecasts of the British economy and the ‘state’ of government finances on a regular basis, which ‘condition’ the political debate. A government can hardly go against the forecasts in any meaningful way unless it wants to face claims that it is ignoring so-called ‘experts’. The ‘independence’ assumption is, of course, loaded because first of all the senior positions in OBR are determined by the Treasury Committee, which is a political construct. And the professional positions within the OBR will be drawn from the mainstream economics profession and so the frameworks for analysis (and forecasting) will reflect the dominant neoliberal bias of that profession. Thus, if we stack a ‘fiscal council’ with mainstream economists we don’t get ‘independent’ analysis. We get Groupthink. Just look at the track record of the IMF. So the OBR is certainly not independent in an ideological sense, given that the dominant paradigm in macroeconomics is firmly neoliberal, despite some trying to claim otherwise. Further, like the IMF and other similar organisations, the OBR regularly produces systematic forecasting errors, which are overlooked because their inputs into the public debate are privileged by their status. The semblance of ‘expertise’ gives the OBR an authority that their output record doesn’t warrant. Sometimes I think that people have become so inured to the shifts that have occurred under the neoliberal era that they forget context and live in a totally fictional concept of normality. So heartland neoliberal characteristics become ‘normality’ – progressive even! That is how far the Left has become captive to these ideological constructs. In the current context, the standard neoliberal line deems that key economic policy decisions should be taken out of the political process and the discretionary judgement of elected politicians, and, instead, the responsibility should be vested in so-called ‘independent institutions’. In our latest book – Reclaiming the State: A Progressive Vision of Sovereignty for a Post-Neoliberal World (Pluto Books, September 2017), we examine the concept of depoliticisation in some detail. The faux concept of central bank independence was the first step in this retrogression away from democracy. This concept came straight out of Monetarism and Milton Friedman’s initial attacks on policy discretion and the need for policy rules. 1. The sham of central bank independence (December 23, 2014). Friedman used this ruse to recommend that central banks should just follow a monetary growth rule. The Bank of England was the first central bank to adopt this approach in the early 1970s and abandoned the approach shortly afterwards because they soon learned that a central bank in a monetary economy cannot ‘control’ the money supply. The fact that Monetarism continued to gain acceptance and become the dominant paradigm is amazing when we consider one of its fundamental precepts – the ability of the central bank to control broad money – was shown to be impossible. It was, in fact, a triumph of the embedded ideology over substance. Which really was the point all along. The Monetarist attack on discretionary policy was intensified with the publication of the work of Finn Kydland and Edward Prescott (1977) who distinguished between ‘time-inconsistent’ and ‘time-consistent’ policy. They claimed that a time-inconsistent policy would be popular in the short-term but would fail to achieve its long-term objectives, whereas the opposite is the case for time-consistent policies. An example they would use relates to central banks who have a charter to maintain price stability but realise that there might be some costs in higher unemployment (according to the Phillips curve tradeoff). The central bank makes its decisions in the knowledge that the public form their future behaviour, in part, based on rational expectations of policy settings. So they announce that they will maintain policy settings that exclusively focus on the retention of a low inflation rate, by hook or by crook. This is claimed to shape the expectations that people form so that they expect low inflation and behave accordingly (in their price and wage setting decisions), which reinforces the policy target. But Kydland and Prescott claimed that that alone would not be credible because people would soon work out that the central bank would relent on its ‘low inflation’ policy and introduce expansionary monetary policy in order to reduce unemployment. They claimed that people work this out straight away because they are assumed the know the true economic model (by dint of the rational expectations assumption). As result, they ignore the central bank statements and act as if inflation will worsen. In doing so, they make decisions that lead to higher inflation. Accordingly, the solution to this problem, was that discretion of monetary policy makers had to be eliminated by a rule that cannot be easily changed. This is the essence of the ‘central bank independence’ narrative. Proponents claim that the imposition of the rule would establish credibility among rational people who would then deliver low inflation through their behaviour. The rub is, of course, that this monetary rule would probably lead to higher unemployment and output losses. But they assumed those losses away as, at worst, short-term adjustments as expectations adjusted to a lower inflation environment. Once expectations, the NAIRU (the neoliberal full employment concept) would be asserted via the market and so there was no need to be concerned about the initial rise in unemployment. In other words, the mantra was (and is) that the central bank if left to pursue an inflation target and not worry about other policy targets, will deliver full employment anyway. But be under no false impression – British ‘Labour’s Fiscal Credibility Rule’ is a product of these developments and attempts to cast it as progressive are just in denial of the roots of the ideas underlying the Rule. The whole modern meaning of credibility in economics comes out of this mainstream economics literature and rely on a number of assumptions that defy reality. For example, the assumption of rational expectations is unsustainable. Please read my blog post – The myth of rational expectations (July 21, 2010) – for a detailed discussion. Further, the idea that central banks should be independent of the political process was a key part of the emerging neoliberal agenda and the claim that governments could not permanently reduce mass unemployment using fiscal policy. The central bank independence push was based on the Monetarist claims that it was the politicisation of the central banks that prolonged the inflation (by “accommodating” it). The arguments claimed that central bankers would prioritise attention on real output growth and unemployment rather than inflation and in doing so cause inflation – as in ‘time-inconsistent’ policies (above). The Rational Expectations (RATEX) literature which evolved at that time then reinforced this view by arguing that people (you and me) anticipate everything the central bank is going to do and render it neutral in real terms but lethal in nominal terms. In other words, they cannot (permanently) increase real output with monetary stimulus but will always cause accelerating inflation if they try. There were variations on the theme, with some New Keynesians claiming that there could be short-run output gains and declines in unemployment, but these would be wiped out over time as expectations adjusted. So the message was that in the extreme version – do not use fiscal policy to try to steer aggregate spending at all – and in the less extreme version – balance the fiscal state over a cycle and never use the currency-issuing capacity to cover deficits. But underlying the notion was a re-prioritisation of policy targets – towards inflation control and away from broader goals like full employment and real output growth. Indeed, whereas previously unemployment had been a central policy target, it became a policy tool in the fight against inflation under this new approach to monetary policy. Accordingly, mainstream economists claimed that the only way the government could permanently reduce unemployment if they thought the current level was too high was via supply-side policies – deregulation, withdrawal of income support, etc. During the GFC we saw the venality of this reasoning, when, for example, the European Commission claimed that the steady-state (natural) rate of unemployment in Spain had risen to around 24 or so per cent, when prior to the crisis it was well below 10 per cent. The ‘independence’ argument is always clothed in authoritative statements about the optimal mix of price stability and maximum real output growth and supported by heavy (for economists) mathematical models. If you understand this literature you soon realise that it is an ideological front. The models are not useful in describing the real world – they have little credible empirical content and are designed to hide the fact that the proponents do not want governments to do what we elect them to do – that is, advance general welfare. Recall, that the main New Keynesian model didn’t even have a financial sector embedded in it. But still they made these claims. In this blog post – Central bank independence – another faux agenda (May 26, 2010) – I provide a lot more detailed discussion. Further, when you study the inflation targetting literature you find that the claims about its effectiveness in disciplining inflation are grossly exaggerated. As I explain in this blog post – Inflation targeting spells bad fiscal policy (October 15, 2009) – the evidence is clear – inflation targeting countries have failed to achieve superior outcomes in terms of output growth, inflation variability and output variability; moreover there is no evidence that inflation targeting has reduced inflation persistence. But the emphasis on monetary policy is consistent with the dominant themes in this neo-liberal era – that fiscal policy should be passive and monetary policy should be the primary counter-stabilisation tool. Further, what about the claim that by forcing a rule-driven central bank to concentrate exclusively on inflation control, the economy naturally produces full employment? A second’s thought should tell you that if accelerating inflation reflects cost-push and distributional conflict factors, such an approach will always require higher unemployment to reduce these pressures. Further, the result of this approach has been elevated and persistent unemployment rates in most nations. The sacrifice ratio concept is used to measure of the costs of monetary policy disinflation strategies, which characterise the inflation-targetting era. Some years ago I did a lot of work estimating sacrifice ratios for various nations. There is a detailed discussion of this work in my 2008 book with Joan Muysken – Full Employment abandoned. The sacrifice ratio is defined as the cumulative loss of output during a disinflation episode as a percentage of initial output divided by the reduction in the trend inflation rate. So, if we calculated a sacrifice ratio equal to 3, this can be interpreted as saying that a one percentage point reduction in trend inflation is accompanied by a 3 per cent loss of output (measured from the most recent peak). There is a vast literature on the estimation of sacrifice ratios which typically find that disinflations are not costless and, are in fact, significantly damaging. The fact is that the estimates of sacrifice ratios for Britain were low in the 1970s but have risen significantly in the neoliberal period when central banks started to ‘fight inflation first’. I consider that issue in this blog post – Inflation targeting spells bad fiscal policy (October 15, 2009). The passivity of fiscal policy proved very costly as unemployment persisted at elevated levels. So the New Keynesian emphasis on the primacy of monetary policy over fiscal policy is not a reflection of what is the most efficient way to deliver macroeconomic stability. The GFC was a manifestation of how this approach fails to deliver stability and produces massive real resource wastage. And the GFC also taught us another thing. Unlike the standard claims by New Keynesians that fiscal policy was an ineffective counter-stabilisation tool and monetary policy was to be preferred, the GFC proved beyond doubt that monetary policy is incapable of arresting a major collapse in non-government spending and incapable of actually generating accelerating inflation. Fiscal policy stimulus saved nations from the crisis. The New Keynesians slip and slide here and invoke their ‘zero-lower bound’ story to defend their position. But that won’t work either. Central banks tried every trick in their book to no avail. Yes, nominal rates reached a ‘zero lower-bound’ but at the same time, central bank balance sheets expanded beyond all imagination. Still inflation remained low and where fiscal austerity accompanied these monetary developments, growth stagnated. So, it is important to understand that these developments in economic policy were all aimed to reduce the capacity of elected politicians to make decisions that would push the ‘market’ rather than accept what the increasingly deregulated ‘market’ delivered. They were hardly what I would call the policy developments that a progressive government would seek to support. One of the repeating themes in the documents that support fiscal rules such as that proposed by British Labour is that without them there is a so-called ‘deficit-bias’ in policy settings. This story has it that government’s cannot resist lobbying pressure to retain certain spending programs or to give tax increases and so over time deficits persist and the public debt ratio rises inexorably. In this blog post – The New Keynesian fiscal rules that mislead British Labour – Part 2 (February 28, 2018) – I discussed the work that appears to have influenced the Shadow British Chancellor in the design of Labour’s Fiscal Rule. The paper Issues in the Design of Fiscal Policy Rules – from the National Institute of Economic and Social Research (published May 20, 2014) puts the deficit-bias concept at the forefront of its analysis. In that paper they make assertions about what an optimal fiscal rule would like like which they claim follows from some formal “welfare-maximising” analysis. A closer examination shows the formal analysis does not generate the rules they present – it is by the authors’ own admission “undeveloped” and incapable of any definitive result. That is a common approach of New Keynesian analysis. Start by blinding the reader with some abstract mathematical model that carries assumptions that cannot apply to the real world. Then jump to some assertions that are not capable of being derived from the formal model but satisfy the ideological intent (or intuition) of the author. Then claim the assertions follow from the abstraction. They assert that OECD governments (in general) have not followed these rules and instead the public debt ratios have “steadily increased since the 1970s”, which is evidence of what they call “deficit bias”. Which by nothing more than their own biases leads to the conclusions that this behaviour is ‘bad’. 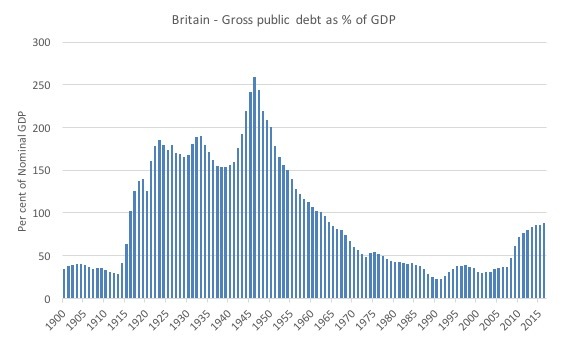 The following graph is drawn from the Bank of England’s – A millennium of macroeconomic dataset – and shows the gross public debt ratio from 1900 to 2016. It rises as a result of the prosecution of World War One, then the Great Depression, then World War Two, falls steadily as GDP growth outpaces the deficit support for that growth (and the non-government sector grows strongly), rises significantly during the massive recession of the early 1990s and again in the GFC. All of that to be expected especially in the Post Bretton Woods era where the British government maintained the, then unnecessary, practice of matching its deficit spending with debt-issuance. Deficits always rise in recessions via the automatic stabilisers. The situation is even more emphatic if I was to consider net public debt rather than gross debt. 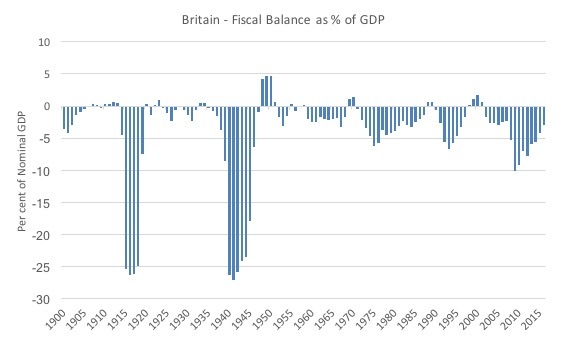 And similarly, there has not been a bias to increasing fiscal deficits over the period as shown in the following graph. But I would not want you to think that these patterns, particularly, the latter graph demonstrate responsible fiscal policy management. To make that assessment we need context and there are times in this period, particularly in the last 50 years where fiscal policy has been excessively constrained. One just needs to examine the history of the unemployment rate to know that during the latter half of the 1970s, in the early 1990s and then during the GFC there was much more scope for fiscal expansion than occurred. In this blog post – The New Keynesian fiscal rules that mislead British Labour – Part 3 (March 1, 2018) – I expanded on that theme and much of the detail in that post has deep relevance (and correspondence to this post). The conceptual problem with the ‘deficit-bias’ hypothesis, quite apart from its lack of empirical support, is that since the early 1970s after the collapse of the Bretton Woods system, fiscal policy was freed from the constraints of having to defend an agreed exchange rate parity. As I explained in this blog post – The full employment fiscal deficit condition (April 13, 2011) – the only appropriate deficit target is whatever is required to ensure the overall savings desires of the non-government sector are achieved at a full employment level of output. Think about the rolling five-year constraint that the deficit has to balance at least on recurrent spending and taxation revenue and reduce the overall public debt ratio. Consider a nation that is mired in a deep recession, yet central bankers haven’t dropped rates to zero. So monetary policy remains the main stabilising tool. The fiscal rule implies that the government would have to cut net recurrent spending – perhaps dramatically. Which would be massively irresponsible. Trying to claim those cuts will be offset by Golden Rule capital expansion is fraught given the types of spending that are required to maintain welfare (income support etc) during a deep recession. But there is another element that is forgotten in these context-free discussions of deficit-biases. As I argued in this recent blog post – The fundamental realignment of British society via fiscal austerity (July 30, 2018) and an earlier blog post – Household debt in Britain on the rise – lessons not learned (April 17, 2017) – one of the consequences of the obsession with cutting deficits in Britain as a goal in itself, without regard to the state of the external and private domestic sectors has been to rely on ever increasing private sector debt to sustain economic growth. The deregulation of the financial markets and the subsequent Blairite ‘light touch’ oversight coupled with the fiscal squeeze saw British household debt reaching record levels. This squeeze has intensified as British wages growth has flattened out and increasing proportions of real income have been distributed to the top-end-of-the distribution. Not only that, the current account deficit has increased steadily which has drained growth. That is not necessarily a bad thing in itself but it requires either a stronger spending contribution from the government and/or the private domestic sectors. But when the private domestic sector spending growth is sourced by excessive credit growth and accumulating debt the situation becomes unsustainable, especially when there is fiscal drag. So far from being a period marked by ‘deficit-bias’ the last four decades in Britain have been marked by a ‘private debt bias’ which has rendered the British economy prone to crises. The Labour Party Fiscal Rule will not reverse that trend and will probably reinforce it. I mentioned the Golden Rule in the earlier discussion. There is a subset of mainstream economists – referred to as ‘deficit doves’ – who work within the so-called orthodox (neoliberal) ‘government budget constraint framework’, which asserts falsely that a currency-issuing government faces financial constraints on its spending, but who still argue that in some cases, it is more fruitful to concentrate on stimulating economic growth, than it is to anxiously guard government deficits. When? In the New Keynesian world, these economists cite the ‘zero-lower bound’ case where they claim monetary policy is ineffective. From their viewpoint, public borrowing is constructed as a way to finance capital expenditures. Since government invests a lot in infrastructure and other public works, those investments should at least allow for a deficit when there is a short-term need for stimulus. This was already recognised by the classical economists as a golden rule of public finance. So even within an orthodox public finance model, their is some flexibility for fiscal deficits as long as they reflect spending that will ‘pay for itself’ through rates of return on infrastructure, for example. This capacity for flexibility is built into the Labour Party’s Fiscal Credibility rule as noted above. However, the ‘flexibility’ might not be all that it seems. The one advantage is that public investment expenditure does not have to be used in a counter-cyclical manner – cutting when non-government activity is declining – to meet pre-conceived fiscal balance targets. Overall fiscal austerity is damaging because it usually has long-term negative impacts. This is because in political terms, it is much easier to cut capital expenditure than current expenditure, the latter being more directly noticeable for voters on a daily basis (pensions etc). These cuts not only undermine current economic activity and pushes up unemployment, but, also undermines the future growth potential by slowing the rate of capital accumulation. So within the neo-liberal fiscal conservatism, the introduction of a Golden Rule might remove the bias against public investment. Proponents of the Golden Rule also appeal to its equity advantages whereby the public expenditure is steadily financed over time as the debt is repaid, which means there is a better matching of who receives the benefits from the services flowing from the infrastructure and who pays for it. Clearly, once we grasp the essentials of Modern Monetary Theory (MMT) we know that this claimed matching of costs and benefits overtime is somewhat misleading. The true ‘cost’ of providing public infrastructure is not the flow of financial outlays (including interest payments) over time but the real resources that are deployed to construct and maintain the infrastructure. For most projects, the cost is mostly incurred upfront in the construction phase, which means the current or near generations still end up bearing most of the costs. However, there are many problems with the concept of the ‘Golden Rule’. When we get into demarcation issues as to what should be classified as net investment spending, the Golden Rule essentially breaks down. While the split between current and capital is normally defined as some time period in which the benefits of the spending are exhausted (less than or more than 12 months usually), it is more sensible to think of capital expenditure as that which improves the potential productive capacity of the economy. A progressive approach should conceive of productivity much more broadly than the narrow concept that mainstream economists like those in the OBR tend to focus on. Productivity is not just the contribution an input makes to the private profit bottom line. When discussing the Job Guarantee, for example, I often make the point that there is inherent productivity in such a job because the children get to see their parents leave home in the morning and go to work – thus avoiding the well-researched intergenerational disadvantages that children endure from growing up in a jobless household. So productivity is a very broad term in my view. In a progressive policy agenda, the definition of productive capital should thus be very broad? One could make a strong case to include much of the recurrent spending on health, education, research and development along with spending on bridges, transport and other physical capital as capital items. For example, the public investment in the education of its population delivers massive social and private returns over the person’s lifetime. These returns are not exhausted within 12 months. Why is that not classified as capital expenditure? If education and health expenditure on teachers and nurses and libraries and books, for example, are considered as current spending, then the Golden Rule biases total public spending against it in favour of ‘building bridges’, which might be a poor use of the society’s real resources. The bias towards physical infrastructure and financial assets is reflected in what governments put in their so-called financial statements – specifically their balance sheets or statements of financial position. I explain that point in detail in this blog post – The non-austerity British Labour party and reality – Part 2 (September 29, 2015). The point is that current definitions of capital items would bias the application of the Golden Rule to be too restrictive in terms of advancing general well-being in Britain. If Labour broadened what it would consider to be capital expenditure then the Golden Rule would be less rigid than otherwise. However, the whole framework is based on a false notion that taxes and bond-issuance fund government spending. But even with that obvious observation taken as given, Labour would face substantial difficulties using the Golden Rule component of its fiscal capacity exclusively in a counter-stabilisation role. There is only so much capital infrastructure spending (under current definitions) that an economy can absorb to drive the necessary growth and maintain full employment. And in times of recession, before a zero-lower bound is reached large outlays on welfare and income support payments are typically required, in addition, to the collapse of tax revenue. That would make it very hard to achieve both a rolling five-year current fiscal balance and reducing the public debt ratio over the life of a government. The point here – that just the idea that a currency-issuing government such as in Britain has to issue debt to fund deficits and it is only safe to do that for capital items (whatever they may be) is a neoliberal construct without foundation in the characteristics of the legislated monetary system. The overall edifice of the fiscal rule is of that nature. Sorry. If the Labour Party wasn’t trapped in these neoclassical concepts (here I am talking about the economic theory of which neoliberalism exploits) then it could free itself altogether of these voluntary constraints. For example, the Labour Party could get around them by avoiding debt issuance altogether and instructing the Bank of England to honour all cheques HM Treasury issues. But if they are prepared to embrace that then they should just be able to abandon the whole charade and admit that the deficit (current, capital, whatever) is a ridiculous financial balance to target and obsess about. I know that some will argue that they frame their policy in orthodox terms for political reasons, to defray the conservative backlash. And it is true, there is some flexibility in the Fiscal Rule. But it is likely the degree of flexibility is overstated. But, the problem is that if they adopt and successfully achieve progressive policy targets, then it is almost guaranteed that they will fail to meet the rule. That would not be an economic problem. But it would be a huge political problem and would give the conservatives all the ammunition they needed to run the line that Labour is fiscally irresponsible. In my view, it would be a better strategy, while in opposition, and while the Tories are so hopeless, to spend time reframing the debate away from the neoliberal obsession with deficits and public debt, and, instead, elevating progressive goals of full employment, environmental sustainability, equity etc to the centre stage. That would deliver much more sustainable long-term benefits than remaining trapped in this neoliberal macroeconomic mindset. But then the Shadow Chancellor would need to get some better advice. In Part 3, I will bring the discussion together in a shorter exposition as to why certain policies that exploit an understanding of MMT are progressive and will not drive the currency into worthless oblivion. Especially when they think increasing interest rates fights inflation in which case any real data to match that theory is almost impossible to find. The real data only shows up when the opposite is true. Turkey or Terkey will show the goldfish what happens when they cut their interest rate. See Brazil or Russia or Volcker for details. The Institute of Fiscal studies is exactly the same full of Micro economists reporting on Macro. If you asked Mr Paul “reinhart and rogoff ” Johnson to explain Japan his head would explode. True to form the establishment awarded him Commander of the Order of the British Empire, for services to crimes against humanity sorry I mean the social sciences. If the BBC put Mr Paul ” we are still on the gold standard” Johnson head to head with a MMT’r he would last as long as a Ferrari going 0-60 before he was exposed as the idiot that he is. He would morph into Homer Simpson before our very eyes. I think the way you get awarded with a Commander of the Order of the British Empire badge nowadays is to stand with two jack boots on the necks of the poor instead of just one. Do whatever is in your power to gift as much as you can to the banking class and the financial sector. Not to mention the next impending crisis and whatever comes out of (non-)Brexit will make a “balanced cycle” a fool’s errand. Chloe Westley is another sailor who sails on the good ship boaty Mcboat face from the Tax payers alliance. Along with all the other ship of fools. Another right wing, neoliberal, lobbying think tank who “Moor often than Knot” are on the BBC when you change channels from Neighbours and Home and away. Which are coincidentally on twice a day because you don’t believe them the first time around. The OBR, IFS, Tax payers alliance all trying to fish with a net large enough to try and capture the next generation of minds to brainwash. If that wasn’t enough we now have ” economics 101 ” on a radio or a class room near you that is going out into communities to teach working class people that we still use the gold standard and fixed exchange rates. That will make as much sense as a Mandarin weather forecast and convince them that the government finances operates like Mrs. Beeton’s Cookery Book and Household budget. I thought part 1 was great and only expressed a disappointment I would have to wait the weekend for part 2. And now have to wait for part 3. But I still think the name you have given for the posts might be unfortunate. Since not everyone picks up on sarcasm, sometimes intentionally. And while I did ask a question about Turkey, it was pretty clear that I was looking for help in responding to some of the same things your emailers were giving you. What the heck does Turkey have to do with MMT anyways?- from what I have read they weren’t following any MMT prescription/description (whichever you prefer as to that). Certainly MMT points out the dangers in borrowing in currencies the government does not issue. …the drive to balance the budget is neoclassical. Neoliberalism refers to to privatisation and lower Labor standards. It’s awful people are emailing with abuse. Fiscal rules are not just bad economics they are bad politics. They give your political opponents a stick to beat you with. will have to raise taxes or cut commitments. They will give you a merciless beating and you have handed them the stick! Looks like Turkey is this year’s zimbabwe. It has hardly been following an explicitly MMT policy so I do not see it as much of a refutation. Their government has as little to commend it as mugabe’s. I’ll be interested to read henwood’s takedown of MMT, I’ve read/listened to him for a few years and despite his avuncular manner, like most economic pundits, he gets prickly rather quickly. include the power to stop the fall of the value of your currency internationally. As a follower of MMT, the situations in Venezuela and now turkey seem to show how fragile modern society is. Where’s Labour’s economic adviser’s advice to put a “collar” around the creation of private debt money if they’re so worried about inflation? After all that private debt created money swirls around in the economy just like government created money! That such advice is conspicuous by its absence tells you all you need to know about how unfit for office the current Labour Party is under Corbyn and McDonnell. And while I did ask a question about Turkey, it was pretty clear that I was looking for help in responding to some of the same things your emailers were giving you. It was inevitable really that Turkey’s current problems would raise the question of how an MMT-aware government might have dealt with them, or avoided them in the first place. Turkey will now join that list of unhelpful examples starting with Weimar and including Zimbabwe. Schofield says;Where’s Labour’s economic adviser’s advice to put a “collar” around the creation of private debt money if they’re so worried about inflation? After all that private debt created money swirls around in the economy just like government created money! That such advice is conspicuous by its absence tells you all you need to know about how unfit for office the current Labour Party is under Corbyn and McDonnell. THIS LOGIC APPLIES EQUALLY TO THE TORY GOVERNMENT AND MAYBE YOU SHOULD ACKNOWLEDGE THAT FACT PLEASE. THEY HAVEN’T BEEN FIT FOR OFFICE FOR 10 YEARS. AUSTERITY DAMAGE IS ADDITIONAL PROOF. This should go with out saying Tories are Neoliberal idiots too! But talking of “where’s the private debt collar?” remember the cause of the 2007/2008 GFC where libertarian Alan Greenspan, that great fount of “independent central bank advice,” refused to do anything about “liar loans” for house purchase and ended up having to do a mea culpa in front of a Congressional Investigation Committee? I agree – it risks becoming a hostage to fortune. At the very least I would suggest putting the title in “scare quotes”, or adding a big “-NOT!” to the end of it! Good to see you have reached Stage 3 of 4! Here in the US, the socialist Ocasio-Cortez asks why ‘our pockets are empty’ when it comes to spending that benefits the public at large, but Congress could write ‘a $2 trillion’ check to the elite wealthy without blinking an eye. Unfortunately, Ocasio-Cortez doesn’t provide the answer, which is Congress has no need to borrow money from anyone, foreign or domestic, to finance its spending! She’s sooo close, but yet so far away in understanding. Stephanie Kelton, an MMT economist who advised Bernie Sanders during his primary campaign against Hillary Clinton, has to give her a call. Or maybe you could drop a dime on her, Bill. I was under the impression that Alexandria Ocasio-Cortez was already being advised by Stephanie Kelton (one reason perhaps why she promotes the Job Guarantee). Can you provide a link to what Ocasio-Cortez actually said? (or at least some suitable text I can google for)? I don’t get the link some weirdos seem to be seeing between Turkey aka terkey and the merits (or otherwise) of MMT. I thought that Turkey’s problems (the financial ones I mean – I don’t want to even think about the others) all boiled down to having taken on massive debts denominated in foreign currencies – the precise antithesis of MMT’s teaching. I think most people are referring to Ocasio-Cortez’s interview on CNN’s Cuomo Prime Time program. I won’t post the link to save Bill a moderation task, but if you google “Ocasio-Cortez Cuomo Prime Time” there’s various versions on Youtube or elsewhere. The one I’ve seen was an edited version produced by Momentum (the UK Labour grassroots campaigning organisation) in which Ocasio-Cortez comes across very well in making an impassioned and articulate plea in defence of “progressive” public spending (eg healthcare, education) versus destructive (eg prosecuting wars, tax cuts for billionaires etc). In the clip I have seen there is no evidence either way to suggest whether she personally understands MMT or not (there may be more in longer undedited versions) – she is simply calling out the hypocrisy of the interviewer for only bringing up the “how do you pay for it” argument for acts of public good. Simon, sometimes I wonder if the high interest rates on loans in the domestic currency lead businesses to borrow in a foreign currency at much lower rates. But that can be risky because it exposes them to a depreciation in the exchange rate. When that happens extra pressure is put on the exchange rate as more and more local currency has to be sold for each repayment that must be paid in the foreign currency and that depreciates the exchange rate even more. And increases domestic inflation at least for imported goods. Kind of like a downward spiral. Does this make any sense to anyone? Now I am fairly sure that that first part (outside the square brackets that I have added) is not true. Mike Ellwood, persistent TRADE deficits will require funding via international borrowing if the exporters (or their Central Banks) are not willing to save in the importing nation’s currency. That is what I think at least. Jerry-interesting point. I don’t really know anything about that. I was thinking that higher interest rates can act as a price setter so that higher borrowing costs will push costs up. MMT commentator Mike Norman talks about this. Mike also points out that net assets enter the economy via interest on bonds being higher but in the case of Turkey this may not apply if it has borrowed in dollars so it has to earn the dollars via exports. Didn’t something like you are suggesting happen in Russia a few years ago where people were getting mortgages in dollars then the oil crisis hit and exchange rates plummeted resulting in defaults and foreclosures? Not sure I have much of a grasp of all this! I believe Paul Krugman actually explains the Turkish situation very well here. And I do not believe that anything he explains contradicts MMT in any way, other than that possibly there are times when a trade deficit is not going to be only a benefit for the importers. Simon, there is certainly an income effect of high interest rates as creditors see their income rise. As to what happened in Russia, well you should know better than to ask an American cause we don’t follow international news unless we are blowing something up. And even then we only get one side of the story. Paul Krugman actually has a very good explanation of what is going on with Turkey I think. And it doesn’t seem to contradict much of anything MMT says. I linked to it in a comment that is awaiting moderation but you can read the story at Economists View if you are interested. First comment on links if you don’t have access to the NY Times. MMT does explain the economics of countries even if they do not adopt a JG program, capital controls, zero nominal interest rates or any other policy considered by some as “MMT policy”. I mean, the European Union does not follow any kind of MMT proposals and yet Bill Mitchell is one of the few economists in the world that fully understands what is happening there. That’s one of the many reasons I personally prefer to separate between “descriptive” and “prescriptive” theories. Yes Andre, but the point is that a bunch of people are saying Turkey disproves MMT. Well it doesn’t. MMT says don’t borrow in foreign currency or bad things can happen. That is a prescription. And it may provide a description of those bad things. And that what seems to be happening in Turkey. Isn’t the point that sovereign governments can lose control of their currency very quickly if the money runs against them? It doesn’t disprove anything about MMT except that MMT is wont to believe there is no foreign exchange constraint. Until I came around to a beginning of understanding MMT, I’d no idea just how, (to paraphase Keating), recalcitrant so-called progressives are when it comes to the critical underpinnings. Minor bush-wars have been flaring on the Twits; mostly around posts, or articles by people from poutfits like the Australia Institute. Myself and one or two others feel compelled to challenge this. The argument, paraphrased, goes something like: “Well, this is how the tax/welfare/public good options are framed, so we’re pretty powerless to counter that, so we’ll argue for better taxing of the wealthy’ “. What remain unaddressed by them are the questions as to whether they do or don’t believe that taxation funds FedGov expenditure, for one; but others. Not sure whether they don’t want to try and refute MMT tenets, out of pride, or whether they genuinely don’t understand them. But this stuff is cycling through Guardian OZ and on socmed, and many progressives pick it up as an ‘alternative’. Krugman’s primary stance as being New Keynesian comes out when he says “What you need to reduce the costs of crisis is a combination of short-run heterodoxy and credible assurances of a longer-run return to orthodoxy.” If we interpret Krugman as engaging in advocating political maneuvering, then we can interpret this statement as saying “lie about advocating a short-run heterodox economic program while really intending to implement a long-term one and lie, credibly, about when you will return to orthodoxy when the reality is that you never will”. Then we have to ask: How long is temporary? However, as Krugman is not really at heart a heterodox economist, we find that he is not that different from Portes and Wren-Lewis. By that, I don’t mean to say that everything he says is rubbish. Mainstream economics is so stupid. Henry I guess the point is that the government can ‘lose control’ of the currency (if that means inflation or forex depreciation) if it borrows in foreign currencies, and maybe even if many businesses borrow in foreign currencies, and then relies on foreign exchange markets to try to repay. But the government still probably retains its monopoly on creating the currency and still determines what it will accept for payment of taxes. And as long as it can tax effectively, and enforce those tax payments, it should be able to make the money not ‘run against them’. Pretty much, the government should not borrow in a foreign currency, or should be willing to default completely on those loans. I think. Good advice, I think. And sure, what Krugman considers ‘fiscally sustainable’ is probably different from what MMT considers it, but so what? MMT says their are fiscally unsustainable policies- they are spending policies that don’t take into account what the available real resources are. Different from some debt ratio or government budget constraint- but it is there nonetheless. I was loose with my language. A government can lose control of the exchange rate if it lets inflation become a problem. I would argue this would happen irrespective of whether there is foreign debt or not. Putting capital controls in place might stem the flow, but it is a sign of policy failure. Yeah Henry, I don’t see that at all. You make your money here, you spend your money here. Seems fair to me. Got no problems with capital controls. That’s the end of foreign investment then. Within limits Henry. Not the end of anything- just trying to ensure it does not subvert the public good.